The Kleenhands Superior Hand Dryer really lives up to it's name with it's many useful features. This hand dryer has an automatic infra-red switching system to detect when that dry blast of air needs to be delivered. The Kleenhands powerful airflow combined with comfortable drying temperature ensures that the users hands are quickly and effectively dried in a very hygienic way. Noise is kept to a minimum by the highly efficient technology inside the Kleenhands Superior Dryer, which itself is protected by a 2mm thick vandal-proof steel cover. Though very secure it is easily removed with the correct to allow for easy maintenance. 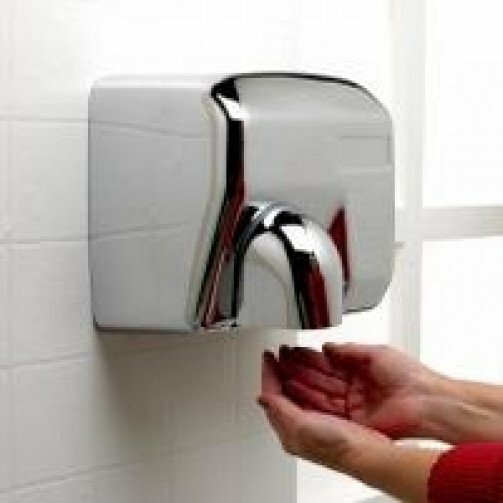 The Kleenhands Superior Hand Dryer comes in a choice of glazed white porcelain or chrome satin (stainless steel look) finishes. The Kleenhands Superior Hand Dryer provides maximum hygiene and performance with minimum power consumption. 230V 50hz, motor 250W, 2.20kw heating element. H: 10' (25cm), W: 11' (28cm), D: 6' (16cm).